Virender Sehwag is known for his witty attitude and hilarious tweets that very often go viral. There have been several instances where his tweets have not only impressed the netizens but at times the former Indian cricketer has stirred a few controversies too. Now, ahead of the IPL 2019 opener, Virender Sehwag tweeted the netizens asking them to name the movie that they would associate their favourite teams with. No sooner the Sultan of Multan tweeted about this, netizens came up with hilarious replies to the post. Sehwag Declined BJP's Offer to Contest Polls Citing Personal Reasons: Delhi BJP Leader. 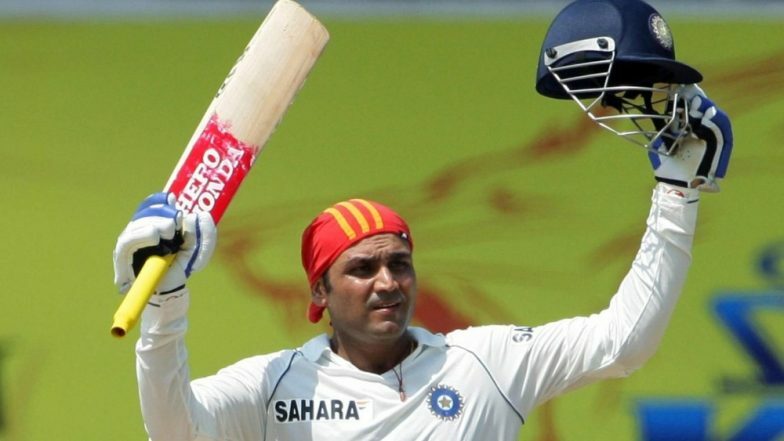 Virender Sehwag is no longer associated with any Indian Premier League team this year. Last year, the former Indian opener was the coach for Kings XI Punjab. But, later in November 2018, he stepped down from the coaching duties. It was way back in 2014 that Sehwag had joined the Kings XI Punjab. Talking about the former Indian cricketer’s tweet, Sehwag posted, “What movie name do you associate with your favourite IPL team ?.” IPL 2019 Live Streaming & Live Cricket Score on Hotstar and Star Sports: Watch Free Telecast of Indian Premier League T20 on TV and Online. RCB too has a name. Name for Chennai Super Kings. Mumbai Indians - Jo Jeeta Wahi Sikandar..
Virender Sehwag was last in news for his advertisement on Star Sports which trolled the Australians brutally. The TV commercial featuring Virender Sehwag had gone viral and had even annoyed Mathew Hayden. Talking about the IPL today, Chennai Super Kings will lock horns with Kings XI Punjab on March 23, 2019, at the MA Chidambaram Stadium. Chennai Super Kings vs Royal Challengers Bangalore Scorecard.